We provide some organizational chart samples and tutorials to help you understand organization charts. Line - direct relationship between superior and subordinate. Lateral - relationship between different departments on the same hierarchical level. Staff - relationship between a managerial assistant and other areas. The assistant will be able to offer advice to a line manager. However, they have no authority over the line manager actions. Functional - relationships between specialist positions and other areas. The specialist will normally have authority to insist that a line manager implements any of their instructions. In many large companies the organization chart can be large and incredibly complicated and is therefore sometimes dissected into smaller charts for each individual department within the organization. Organizational charts are the best way to visualize and understand your workforce. Edraw Organizational Chart is a new, rapid and powerful organization chart software.Being novel, small and exquisite, it is the simplest way to create professional-looking organizational charts - with no drawing required. Ideal for smaller businesses who want to chart up to 100 employees, Edraw Organizational Chart helps you visualize your organization so you can make informed business decisions. 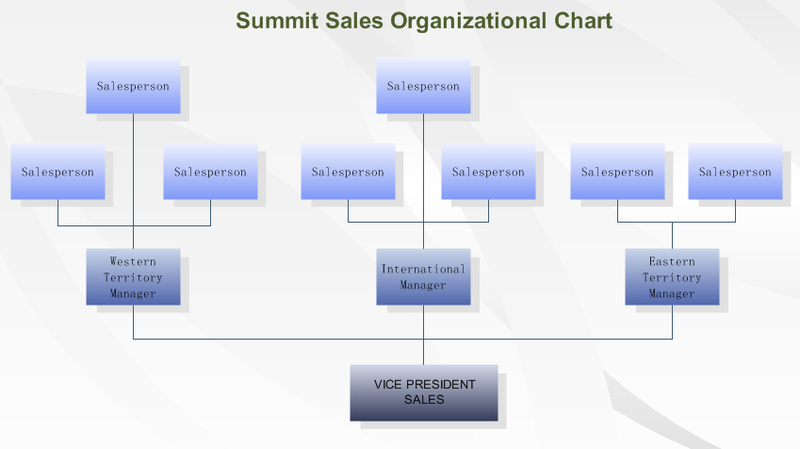 Organizational charts are an extremely effective way to communicate organizational, employee and enterprise information. An org chart makes it easier for people to understand large amounts of information as a visual picture rather than as a table of names and numbers. Organizational charts provide the greatest value when used as a framework for managing changes and communicating current organizational structure. When fully utilized, org charts allow managers to make decisions about resources, provide a framework for managing changes and communicate operational information across the organization. Using organizational chart software, Human Resources can create org charts automatically from HR databases and distribute them to management. Managers are then able to quickly visualize the organization and have the salary, gender and tenure information needed for decision-making purposes. Simply put, managing change is much easier when you can visualize the organization. Organizational charts provide managers with specific departmental information that can then be used as a baseline for planning, budgeting and workforce modeling. It's easy to collaborate on important structural and personnel decisions when you have the overall picture along with the smaller views that make up that bigger picture. Organizational charts can be linked directly to spreadsheets or budgeting tools for interactive what-if analysis, easier planning and decision making. Those organizational charts can then be used to provide scenarios back to executives, finance and HR for evaluation and approval. Managers may also use organizational charts to communicate and solicit feedback from their employees to build future plans. When organizational charts are published and distributed to an entire organization, you have a compelling method for communicating valuable organizational information to all employees. Organizational charts are ideal for sharing the organization's strategic vision, as well as defining responsibilities, dependencies and relationships. The organizational chart also allows you to organize your team with clear responsibilities, titles and lines of authority. No document carries such important information, so concisely, and so easy to understand as an organizational chart. It only shows "formal relationships" and tells nothing of the pattern of human (social) relationships which develop. It very quickly becomes out-of-date, especially in large organizations who change their staff regularly. Chart showing the interrelationships of positions within an organization in terms of authority and responsibility. There are basically three patterns of organization: line organization, functional organization, and line and staff organization. View a brief org chart guide in slides. The easiest way to draw a new organizational chart is by starting with a Edraw template. Simply choose Template Gallery from the File menu, then select from the vast array of organizational chart examples available at your fingertips under the Samples Pane. Templates and examples listed under this category have all the special settings for grid snaps, line- and shape-linking, wizards, and other crucial attributes that make it easy to draw a flowchart. To choose a template, double-click on it.